I say this every month but this month’s box is G-O-R-G-E-O-U-S! Birchbox is totally on point with their box designs – if you’re a subscriber, don’t forget to keep all of your boxes, they’re planning something fun at the end of the year! Another reason I love Birchbox is their INCREDIBLE point system! 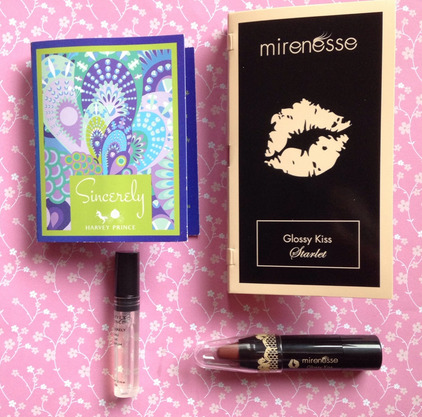 For every item in your box you review, you receive 10 Birchbox points, which is equal to $1 in theBirchbox store. Something new they started this year is if you share your Birchbox on FB or Twitter you will get an additional 10 points! These points add up super fast since you can get $6 or more worth of store credit each month! 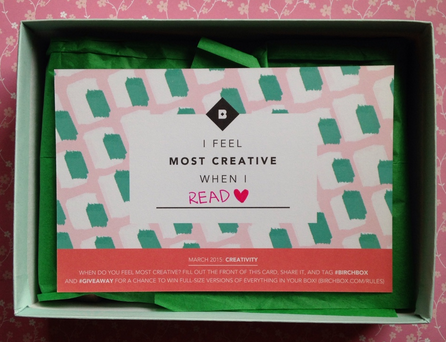 Plus they have some fun opportunities for bloggers/youtubers each month, like the Birchbox Book Club! I was able to read all of Gillian Flynn’s novels – Gone Girl, Dark Places, and Sharp Objects a few months ago and I actually just got an email a few minutes ago saying I will be receiving this month’s book, Better Than Before by Gretchen Rubin! So now for this month’s box! Get inspired with this month’s picks. Expressing yourself hasn’t been this fun since finger painting. Being the dummy I am, I forgot to take a photo of the back of my information card and now I can’t seem to find it anywhere. Argh! The dreaded perfume samples! At least it’s Harvey Prince and a larger vial than I usually get! I’ll stick this in my purse for emergencies but there’s a 99% chance I won’t use it. It doesn’t smell horrible but it’s not a scent I would purchase for myself, I think it’s great for the Spring though! I’m horrible at describing scents but the inside of the card says it’s spicy, sweet, and calming. I was super excited to see this lip crayon, the shade is perfect for me ! I think it’s cool that they sent us a sample that’s half of a full size, this should last me for a long time! I’ve always heard people raving about the Protect & Detangle so I’m excited to try it out! It’s supposed to lock in hair color, protect from heat damage, and add silkiness. I don’t incorporate a highlighter into my makeup routine but I probably will now that I have this little guy! I honestly thought it was a nail polish at first glance haha! I found the miracle cream interesting because it’s a moisturizer, primer, and makeup remover all in one! You apply it as a primer/moisturizer or use a little on a cotton ball to remove makeup! This box has a value of a few cents over $30! I’ll for sure be using 4/5 of the products and I’m super excited about the lip crayon and protect & detangle! I’m also happy that they included a full sized product and decent sized samples for me this month! 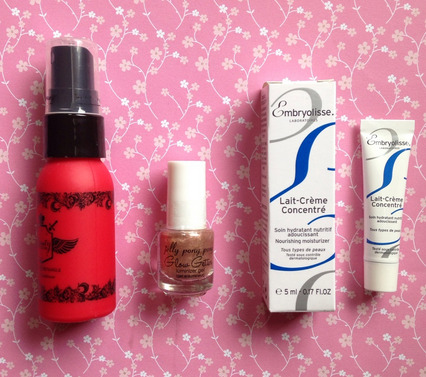 March’s Birchbox is a win for me, if you’re interested in subscribing you can do so here! 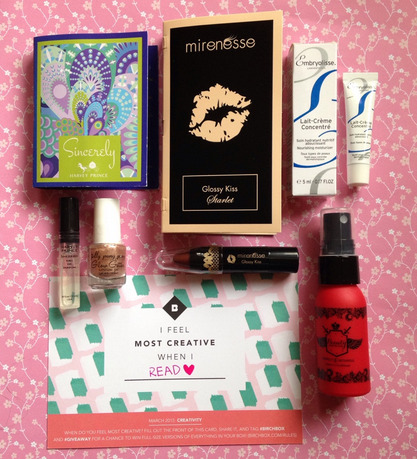 If you’re already a subscriber, what did you think of March’s box, was it a hit or a miss? I really like the Embryolisse moisturizer! I had to use it at night because it's a little greasy (and doesn't contain SPF) but I found it to be rather hydrating. I've also heard you can use it to mix with your powder eyeshadows to turn them into cream eyeshadows! I never tried it, but that sounds like a fun idea. I'm so glad you mentioned that, I didn't know it would be a little greasy, sounds perfect for the night time! I'll also have to try the eyeshadow trick, it sounds super fun! Thank you! I highly recommend Birchbox if you're looking for a new sub, they send some great products and have an amazing points system! I'm actually almost through with the detangler, it smells so good and works great! I may purchase a full size soon! I'm so glad to hear that! I'm super excited about a lippie since it's a colour I can use often! Your blog looks beautiful! I got the Embryolisse Lait-Creme Concentre before and i loved it's effectiveness. Looks like a good box this month! Thank you Val!! Ahhh I'm super excited to try it, I've heard nothing but great reviews! you’ve convinced me to sign up. i was debating between then and ipsy and looking through your monthly posts sold me! !